In today’s post I will comment on how Sistrix works, which in my opinion, is one of most complete SEO tools that also allows you to analyze other fields of your webpage like SEM, social media or generating reports to optimize your website. I’ve been using this German marketing tool mainly for SEO for more than two years and must warn you, it isextremely addictive. To explain how Sistrix works, I would first like to clarify that this tool updates data every week, and I know many a marketer, myself included, who wants up-to-date information to see if the work they have done has been significant. 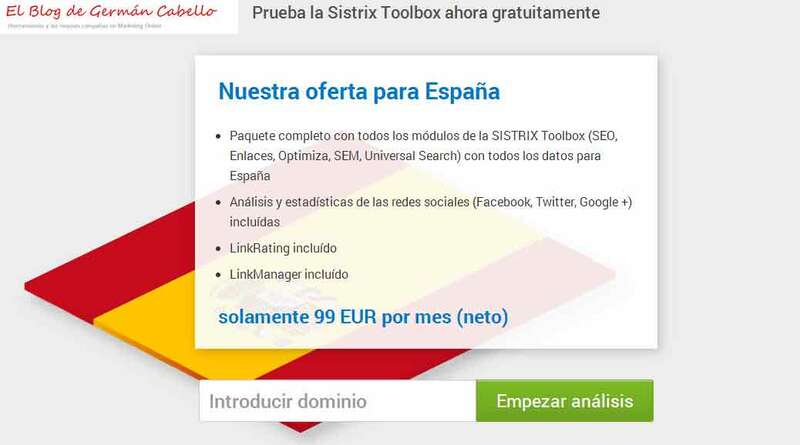 Sistrix is available in three languages (English, German and Spanish) and has five main categories or modules: SEO, Links, Social Signals, SEM, Universal Search Keywords and Optimizer. In this post I will focus on the SEO part of this tool and will discuss the two modules that analyze this field: SEO and Links. 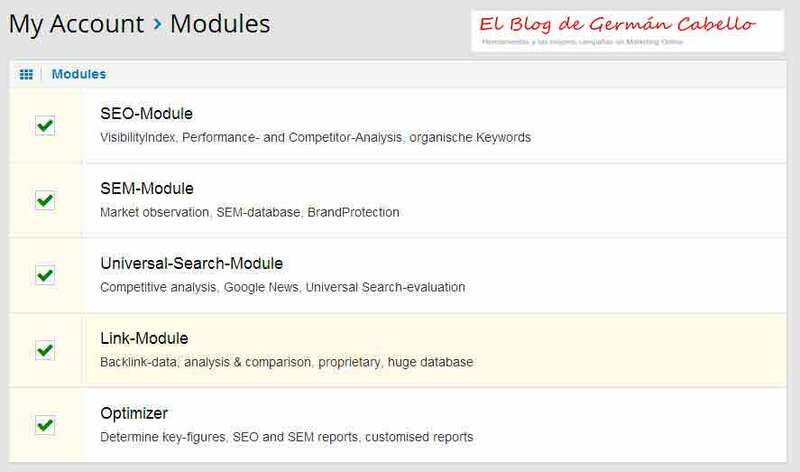 The SEO module is without a doubt the tool that I use the most. The highlight of this tool is that it graphs the visibility of your domain in search engines where you can view the history of your website and see whether you’ve benefitted from or been damaged by Google updates. In the photo below we see a chart and although it seems extravagant, it simply and straightforwardly showsthe degree of visibility of a domain in search engines. 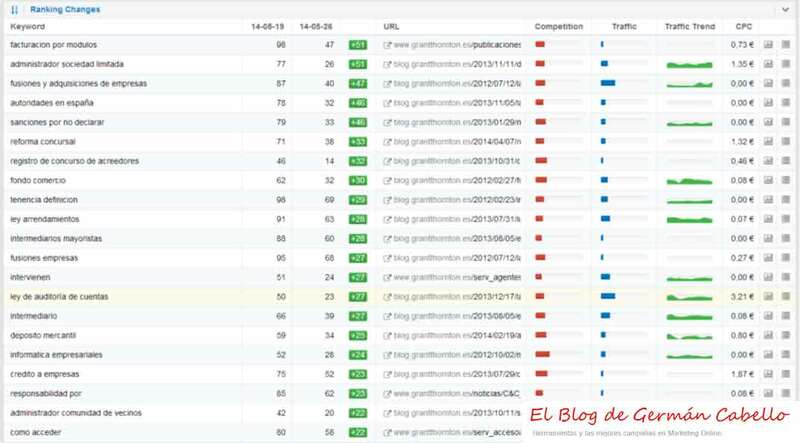 The site analyzed is the blog of a good friend of mine, Txema, and we observed that it began to gain visibility in search engines (Google mainly interests us) in May of 2013. We also see steady progress due to good SEO work employed by its author, achieved primarily by using a greater number of indexed keywords and through linkbuilding, having received links from notable site such as PuroMarketing or Marketingdirecto. I consider this site a clear example, as can be seen in the graphic. Furthermore, Sistrix lets you compare your domain visibility to that of your competitors to quickly detect at which position you find your website with respect to your direct competition, something which I find very useful. In the photo below I placed an example of the degree of visibility of Bank EVO with regards to direct competitors including Santander Bank, BBVA and Bankia. As one would assume, the degree of visibility of Bank EVO in the search engines is well below that of its analyzed competitors. We note that the EVO website began to gain visibility in January of 2013, much later than the others. Although the line shows a continuous upward progression, we found that the bank still has much work to do in SEO. 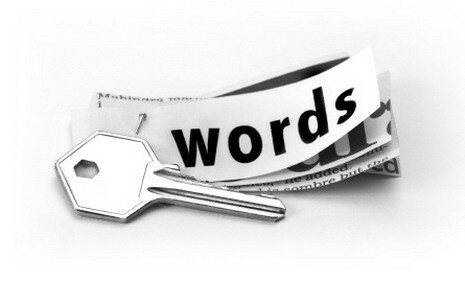 Another important aspect of Sistrix is that it allows us to detect the number of keywords of the website. 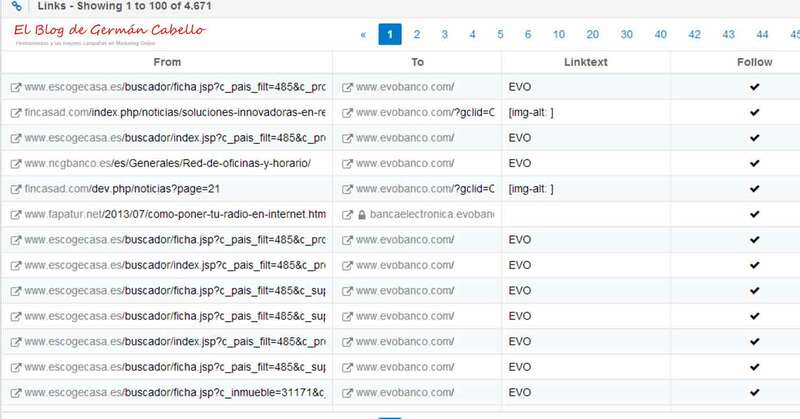 As we can see in the photo below, Bank Evo has 759 keywords, while Santander and BBVA have 4,110 to 2,952. In the chart above we also note that EVO shares a total of 422 to 299 of their keywords with Santander Bank and BBVA respectively. Another important aspect of this tool is that we can analyze each and every one of the keywords as well as the number found in client searches within search engines. With Sistrix you can analyze your website’s keywords as you see in the following photo. Thus, we can observe our position, degree of competitiveness, estimated traffic and CPC of all keywords. Also noteworthy is the ability to know which keywords have undergone major changes, both positive and negative and suggestions for new keywords that make your job easier. The Links module is also very important in terms of search engine optimization analysis, due to theimportance of the quality of external links that direct to your website. In my opinion, a link from the BBC is better than multiple links from domains with little force. Think quality over quantity. I would like to highlight the Anchor text section, which allows you to detect keywords that link you to other pages. As we can see, the websites that link to the word Bank EVO mostly utilize the word EVO with a total of 2,704 links. [n/a] usually refers to the images that link to your website and one positive aspect of the EVO anchor texts is that they achieve a natural SEO, avoiding sanctions. Interesting information is provided about the origin of the link that you are linking to, and whether or not to follow that link. As noted, the monthly payment for this tool is set according to the number of modules you want to sign up for. Feel free try a free trial for 14 days! 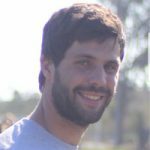 ¿How can you improve your Linkedin profile? 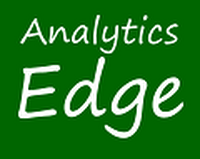 Analytics Edge: Download all kind of data to Excel directly from Google Analytics, Google Search Console, Bing Mastertools or Google Adwords.